Kari and Lyle deserve to win a dream vacation because they are awesome people. Lyle is currently deployed to the Sandbox for the 4th time (I think) over the past 6 years (approx.). Lyle was actually deployed when 2 of his 4 children were born. Kari was able to talk/see Lyle during labor via Skype. Kari has managed to hold down the busy fort at home while working part time. Kari and Lyle are also among the bravest and strongest people I know. They suddenly lost one of their twin sons, Alexander just shy of his 1st birthday to RSV. Instead of dwelling on the negative/sadness, they have become advocates for raising awareness and finding a cure for this terrible virus. Kari even had a one minute audience with the CDC to share her story and the importance of finding a cure. WSB-TV chose the top 5 finalists from entries submitted and then the public voted for the winner on wsbtv.com. 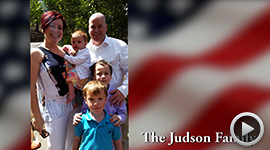 Montlick & Associates is happy to provide the Judson Family with a much-deserved paid vacation! My son has been deployed 4 times, he was blown up in a humvee in Iraq and still has some lingering injuries but still works as a police officer. He is in charge of a National Guard platoon in Lawrenceville. 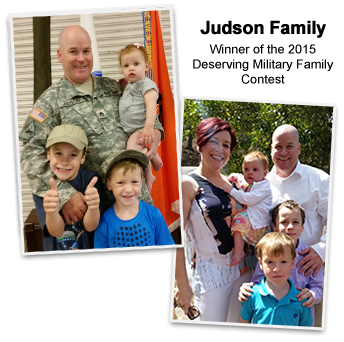 Ryan does a lot of civic duties and food drives with his soldiers and works tirelessly to do right by all his soldiers and teaching them. His wife Mary has been steadfast in support of him taking care of their 2 children Samantha and Axel. He missed a lot of Sammy's young years because of being deployed and he is a wonderful father and a good man. Anyone you talk to will tell you how wonderful Ryan is and selfless he is. They deserve this, due to economy and such it is very hard for them to go do the things they would like and they never have had a real honeymoon but he and his wife are solely devoted to their children and this would be such a beautiful time for them. I currently have 3 sons in the Military. Their ages are 25, 21, 19, and 13. My oldest son has been in the Navy for 7 years and stationed in FL until Sept, My 21 yr old is currently in Great Lakes Navy boot camp and will graduate on July 24, 2015. My 19 yr old has been in the Marines for almost a year and currently stationed in CA. It is very rare that me and all 4 of my boys can get together at the same time. It has been 7 years since we have taken any kind of vacation together. I would love to win this trip to spend some much needed time with all my boys under 1 roof because we don't know when it would possible again. My old college roommate and her husband (also a college friend) became a military family in 2008. Upon graduating college Subomi Odunsi decided to join the military. 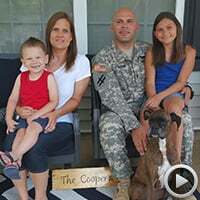 His wife, Lasharay, who was pregnant supported his decision to enlist. Subomi would eventually leave his wife and son for basic training. 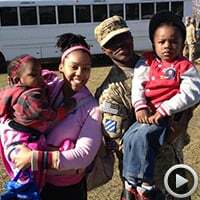 The family eventually relocated to Ft. Stewart, Ga. Two years later Lasharay and Subomi learned they would soon be welcoming a second child. Not long after learning about a second child, Subomi learned he would be stationed in Afghanistan for one year. Two days before being deployed Subomi and Lasharay learned that their son Subomi had a form of autism. Lasharay was left to deal with this on her own for one year in addition to having another small child. Lasharay struggled with dealing with her son's disorder but struggled more not having her best friend/husband with her. 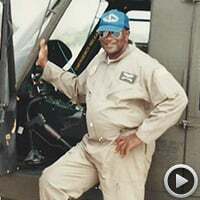 Upon returning home from deployment Subomi sought to be a better provider and soldier and worked very hard to earn a promotion in the military. His hard work paid off and he and his family were finally able to afford a second car. This family deserves a vacation for not only being model citizens but awesome parents. They have donated time and money towards autism research efforts, helped raise awareness all while sacrificing their families time together for the good of the country. 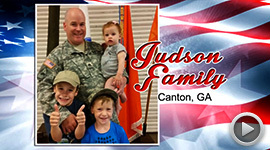 This military family is one that has remained strong through all life has thrown at them from Autism to deployment to juggling two kids and a home they have done it all in the name of love and service to our country. I nominate this family for a vacation they truly deserve. ARMY STRONG! 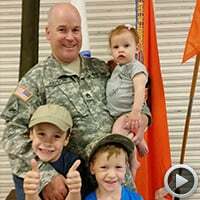 Although retired, he has not stop helping veterans, he's up at 5:00 am and goes to the VAMC to help soldiers through voluntary counseling, and assisting them with applications for benefits, He says, They think that He is helping them, but what they don't know is that they are really helping each other. You see my father was diagnosed with PTSD and this is his way of coping. Our family is deserving because our father is one of the Most deserving. He served and is still serving his fellow comrades, and he still says he does it because it's his Job.